I’m so excited to reconnect with some of these wonderful people, and meet even more wonderful people, in 2019! Delaney Amatrudo, Robert Ariza, Sash Bischoff, Ally Bonino, Jack Brinsmaid, Liz Lark Brown, Sojourner Brown, Liz Carbonell, Max Chernin, Jackie Colquitt, Adam Cuppy, Jessica Fisher, Tara Forseth, Chris Gilroy, Holly Gould, Lux Haac, Molly Hager, Sean Hagerty, Susan Hammons, Chase Hauser, Sam Heldt, BP Houle, Emily Jenda, Benjamin Kamine, Angelina Kelly, Lauren King Thompson, Tara King, Caitlin Kinnunen, Lindsay Kipnis, Marina Kondo, Kelsey Lake, Adam Lawrence, Lily Lester, Allison Lian, Carl Limbacher, Amy Linden, Ellen Macy, Evan Maltby, Lauren Marcus, Patrick Marion, Megan McClain, Eric William Morris, Matt Morrow, Elexis Morton, Sam Paley, Angela Pardini-Gomez, Allison Posner, Katie Rodgers, Lynne Marie Rosenberg, Keith Rubin, Allie Sandler, Danny Saulle, Geremy Schulick, Charlotte Seelig, Libby Servais, Johnny Shea, Rich Silverstein, Allison Spratt Pearce, Phoebe Strole, Nicole Sumlin, Allie Trimm, Kira Vine, Emily Walton, Sally Wilfert, and Jeremy Yaddaw. It also made me take a long, hard look at the work I do and be even more conscious of and conscientious about what I put into the world. More than anything, it forced me to re-up on my forever goal to be aggressively empathetic. In the midst of a difficult year culturally and politically, it was a thrilling year of creation. Here’s to all the 2018 holds! Shaleah Adkisson, Delaney Amatrudo, Robert Ariza, Collin Batten, Michael Berresse, Ally Bonino, Jen Brissman, Michael Bush, Nikki DiLoreto, Hanako Greensmith, Sam Heldt, Ciera Iveson, Benjamin Kamine, Kelsey Lake, Amy Linden, Ellen Macy, Evan Maltby, Lauren Marcus, Megan McClain, Eric William Morris, Elexis Morton, Gillian Munsayac, Brynn O’Malley, Matthew Oster, Andrew Neisler, Allison Posner, Alex Ratner, Ned Riseley, Lynne Marie Rosenberg, Keith Rubin, Sara Sahin, Jaclyn Scoville, Libby Servais, Johnny Shea, Rich Silverstein, Adam Stasiw, Dana Steingold, Dustin Sullivan, Pearl Sun, Nikola Tomic, Elinor Vanderburg, Emily Walton, Jeremy Yaddaw, and Andrew Zinsmeister… I’m so grateful to you all!! And of course, I’m so grateful that I got to go through everything this year with my collaborator extraordinaire, Julia Meinwald. I can’t wait to see what 2017 holds! Director Michael Berresse, always the calm in the many storms we encountered. Music Director Rich Silverstein, who knows Julia and my art better than we do, at this point. Ciera Iveson, for leading her first festival so unflappably. And all of the other artists for all the other shows for building such a supportive pop-up community! With all there has been to contend with in the world in the weeks after the festival, I’m so happy to be able to carry the joy of this experience with me right now. And I can only hope that NAMT will give us the chance to take our story out into a world that might find it a comfort or a conversation starter! I couldn’t have been more happy to have seen PIED! come to life tonight at the Merriam Theater. We got to see the way it moves, the way it breathes – all brought to life by an amazing team of actors and collaborators at the University of the Arts. Thanks to director Ben Kamine for leading the way and giving us a complete picture of the work we have. Thanks to music director Christopher Tolomeo for taking on this monumental task. Thanks to student assistant director Chelsae Bazzel and student stage managers Alyse Hogan and Stef Zamparelli for holding it all together. Thanks to actors Marcus Briddell, Bryce Crandall, Patrick Henkel, Katie Markey, Elexis Morton, Matthew Oster, Hannah Parke, Cody Swanson, Jackson Teeley, Bianca Teresi, and Carrie Thorwarth for jumping into this show so fearlessly and graciously. 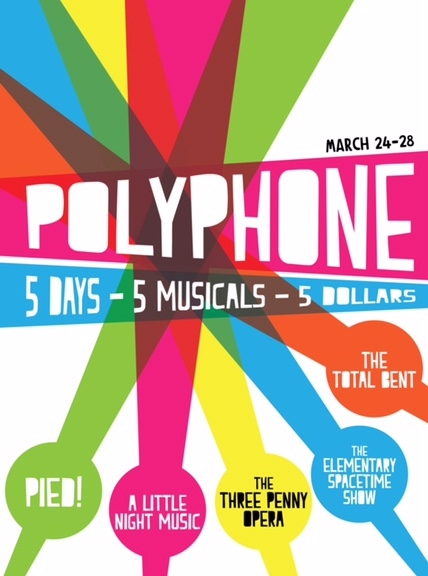 Thanks to Joanna Settle and Cesar Alvarez for founding the Polyphone Festival and bringing us along for the ride. And thanks to David Jenkins, Aziz Naouai, Catherine Logan, Joshua Campbell, and everyone at UArts for making us feel welcome and well taken care of. We’re very excited about all that we learned in Philadelphia and can’t wait to get to work on the next draft!